Find the perfect plan for your business and discover how painless accounting is with ManageMart. With all the time you’ll save, it’s a product that pays for itself. 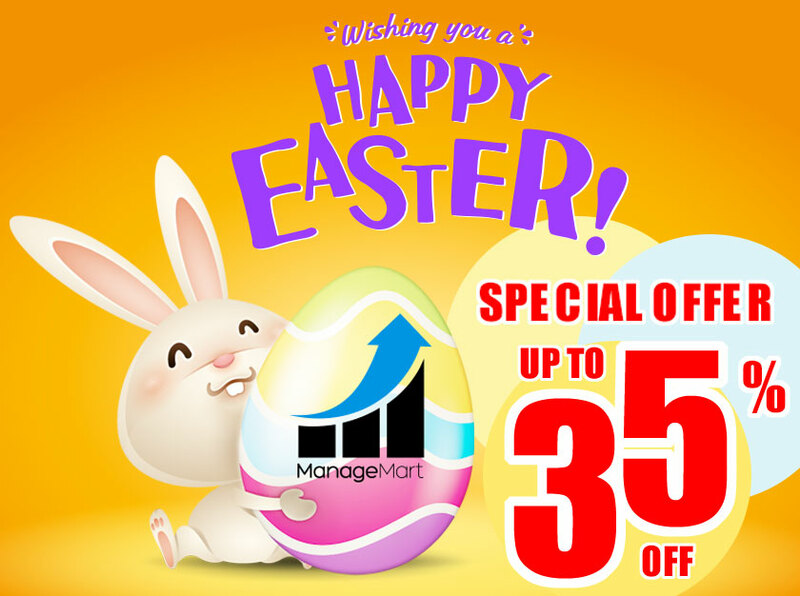 ManageMart team wishes you a HAPPY EASTER and grants you special discount offers! GET Subscription for ManageMart Software Plans with 25-35% OFF DISCOUNT! The discounts can be applied for the 6 months, annual and two-year subscription plans! Sounds good? All features and functions are the same in all plans, only difference is number of users/employees you can manage. CAM (Сustomer Аsset Мanagement) - houses, cabins, villas, cars, land lots, and other assets that are owned by the customer; those assets can be receiving the service of our users (business owners). ACL- managing access rights allowed for the registered employees. Timecards for tracking the working time of an employee. The system for creating and monitoring recurrent invoices (the system automatically creates and sends the invoices to customers). Each account has the same amount and the same list of services and products. Similar to level billing, but there is a specific fixed amount in the contracts that is divided into invoices (in equal parts). Those invoices will be created and sent by the system until the total billed number of invoices to an individual client reaches the total prescribed amount in the contract. After that the contract is marked as successfully executed. Summary statistical information on all payments (debit and credit) that were entered into the system manually and / or went through the system (online invoice payment / synchronization with the bank). The ability for users to locate widget (using the hosted script) to log their users from their sites. 10 reasons why smart business owners choose ManageMart over other field service management software. It is completely free for first-time users. Check our ManageMart and bring your management to the next level. Built-in online payment done in just one click. Most practical routing software for moving at the light of the speed. “All-in-one” features to manage your company on the go. Mailing remotely and instantly through SnailMail. Most affordable FSM software on the market. Spam-free and highly protected platform for securing your information. Highly customizable platform for creating your company’s portfolio and employees individual pages. Enhanced employee management (delegating tasks, tracking time, adding individual responsibilities, managing service completion, and many more).